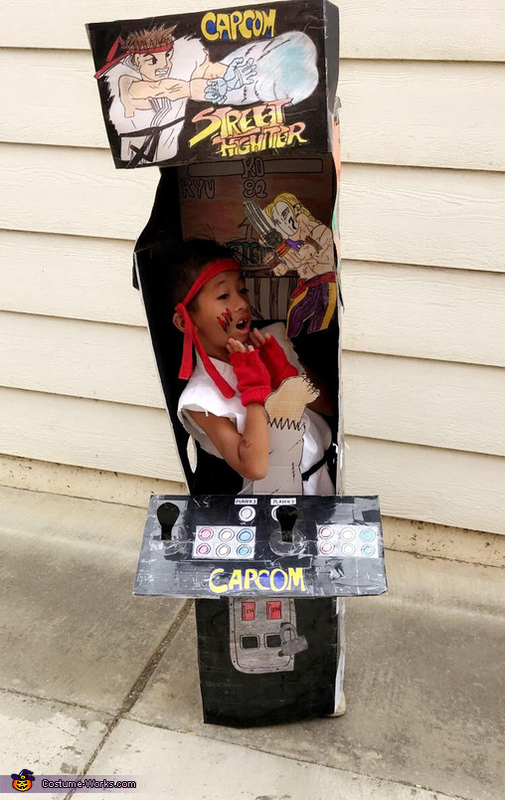 My son wanted to be Ryu from street fighter, I usually add a twist to his costumes every year. So, I decide to make an arcade machine along with his costume. I purchase the black foam poster at dollar tree. I only use it for top portion, and the rest was black poster board (also purchased at Dollar Tree). I realize that i should have used all foam poster all around (you can if you want) so it would have stayed in shape, but i didn't want it to be so heavy for him. Either way it worked out great, because I taped it with heavy tape all around. I drew all the characters and taped it around. Everything was create by paper. Costume: Extra karate outfit. I just cut the sleeves. the belt and head band was made from an old t-shirt. Gloves $1.00 at Walmart.